There were roughly 26 million cruise passengers in 2017, with estimates that 2018 topped 27 million — a number set to grow even further this year. The world’s largest vacation company, TUI, has also recently reported more families now than ever are cruising with their kids. This surge in popularity means cruise lines are spending more money building bigger ships packed with exciting activities, cutting-edge technology, and luxury services — ideal for families looking to embark on their first cruise vacation. Carnival Cruise Line, Royal Caribbean, and Norwegian Cruise Line are set to launch their biggest ships yet. Carnival Panorama, sister ship of Carnival Horizon, offers a top-deck trampoline park and a WaterWorks aqua park with giant tube slide; the Royal Caribbean’s Symphony of the Seas will boast a reimagined Boardwalk complete with sports bar and arcade; and Norwegian Bliss is introducing activities like laser tag, huge electric Go-Kart track, and a 20,000-square-foot Observation Lounge offering panoramic views — endless fun for all the family! Families who like to stay healthy are in for a treat. Cruises are shedding their unhealthy, sedentary image and becoming more health-focused in 2019. For example, Regent and Oceania recently launched wellness tours in select ports. Royal Caribbean will also be introducing a new health-focused menu called “Vitality” full of delicious, fresh foods. Keep an eye out for healthy menus, onboard exercise classes, health and wellness discussion groups, and active shore tours when booking your cruise. Cruises spanning three, four, or five nights are becoming increasingly available as an alternative to the traditional week-long trip. This new freedom of choice is excellent news for many families. Perhaps you’re on a budget that doesn’t stretch to seven nights. Or maybe you’re a first-timer unsure if the family will enjoy their time at sea. There’s no need to miss out on the cruise experience; simply book a shorter trip instead. The cruise industry has continued to update its technology in the past few years. Most cruises now offer wifi hotspots, which is great news if your teens or tweens can’t go for long without their iPads or smartphones. You’ll also be better able to keep up with emails while on vacation if you have the need. Facial recognition technology is being employed to speed up terminal queues and check-in. It can even track passengers and color-code traveling families to improve cruise safety for guests. Additionally, Disney recently introduced wireless voice communications services onboard. This means you can make cell phone calls from your cabin to the shore for roughly half the cost of using a satellite phone. 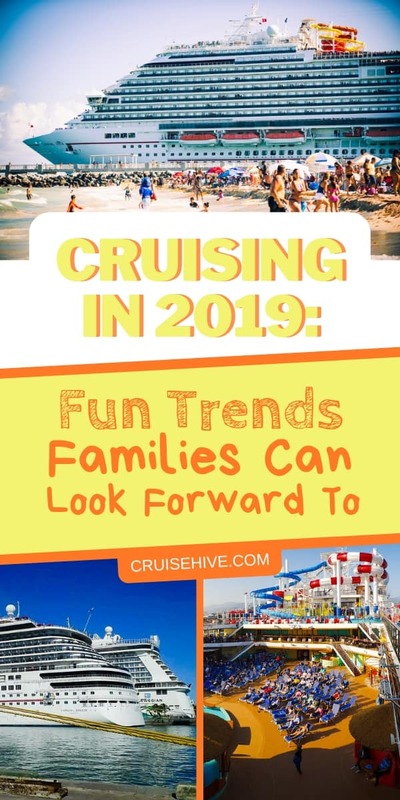 2019 is the perfect time to book a cruise for your family vacation. This year cruise lines are set to be bigger, better, and more technologically advanced than ever before. You’ll find there’s plenty to appeal to families of all generations.